I had such a wonderful time reading all of the comments about your least favorite fabric choices! Within your comments, I realized there are quite a few more types of fabrics that I'd have to agree would never make it into a quilt for me either. Isn't it funny how one of us can be madly in love with a color and another never use it?!! Judy commented.....I don't like modern fabrics or the brights! Thanks for the giveaway! U Keep Sewing commented.....Fun to read all these comments. I can't do pinks or some of the lighter colors, some look like oatmeal. Love red when it acts as a neutral. Don't care for the real busy fabric or the wild colors. Thanks for the chance. Joyful Quilter commented.....I have a very difficult time with purple or lavender - don't like them - but have used them when it was the only color that would work. For me to use them there has to be lots and lots of green also. Congratulations to the winners and my heartfelt thanks to all of you whom took the time to comment. Your comments mean so much to me and keep me writing this blog and so much more. Winner, please email me at Pam@HeartspunQuilts.com with your mailing address and we'll have those scraps on their way to you! I happen to love Civil War fabrics in shades of purple. The problem is, like many other colors, CW repros in plums are few and far between. I sought to rectify that problem! While I do so love purple fabrics, I can't say I make entirely all purple quilts with them. I love adding purple to scrappy quilts. I also favor adding purples in an autumnal and Halloween quilts. When I'm piecing scrappy quilts, I use purples in the same way I use blues and greens in that they can have similar color values. I honestly don't know what I'd do without purples. I was tickled to read how many of you don't care for purples and it's your never, ever color. I totally respect that. I also know that many of you love purple as much as I do. It's my daughter's favorite color! Of course, I've designed an all purple quilt for this collection, and she's already laid claim to it. More about that quilt in an upcoming post as it's being made as I write this. 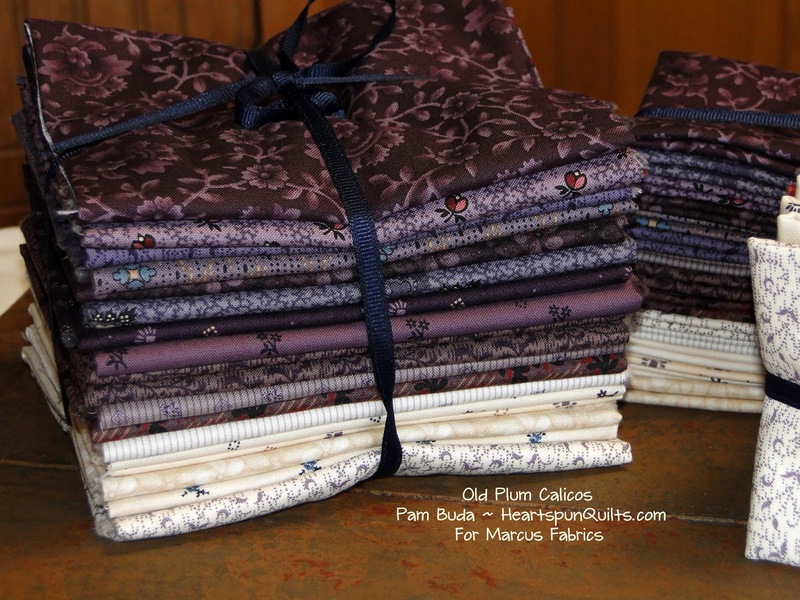 I made a little video of all of the Old Plum Calico fabrics. All of the Old Plum Calico fabrics are reproductions of nineteenth century fabrics from my vintage quilts. As is always the case, the folks at Marcus Fabrics were so very dedicated to getting these colors just the way I wanted them, and I'm hoping you'll love them as much as I do. I thought you'd like to see what the fabrics look like once they've been pieced. After all, that's how you'll be using them, right? 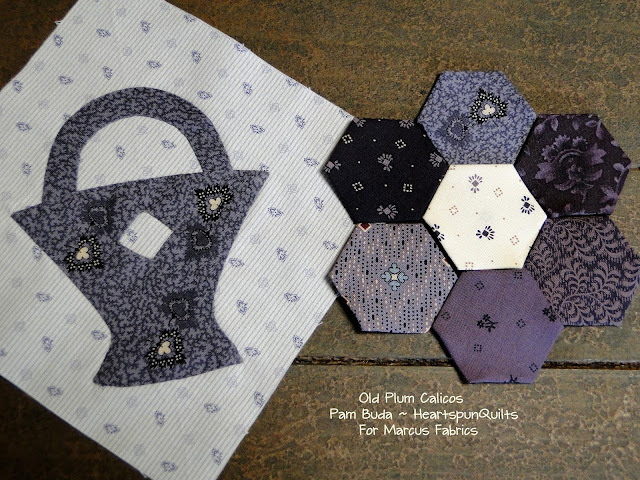 Here's a peek at two of the blocks that are in my new Letters From Grace quilt, which uses all of the prints in the Old Plum Calicos collection. I think it's so nice to see the new fabrics in patchwork. What do you think? If you like what you see, and you're like me and are quite fond of plum fabrics, for a limited time, you can PRE-ORDER a Fat Quarter or Fat Eighth bundle of Old Plum Calicos at 15% off the regular price. Old Plum Calicos are scheduled to be delivered in October, so as soon as they arrive, we'll package your bundle and send it to you mucho pronto! Shipping is extra and is a flat rate of $7. within the U.S. only. International orders, please email me for shipping costs to your home. Thanks so very much for reading my blog, and I hope you find some time to sit back and sew with your favorite color fabrics! New fabric lines are arriving and scraps are overflowing, so that means it's time to send these Star Spangled Liberty scraps to a new home! 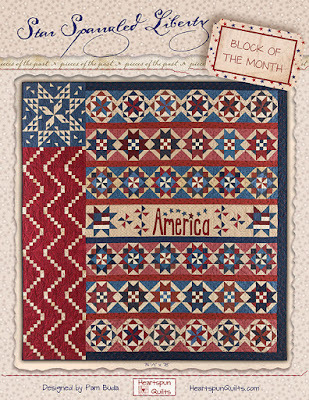 Star Spangled Liberty Block of the Month patterns are shipping to all participating quilt shops right now as the program begins next month! 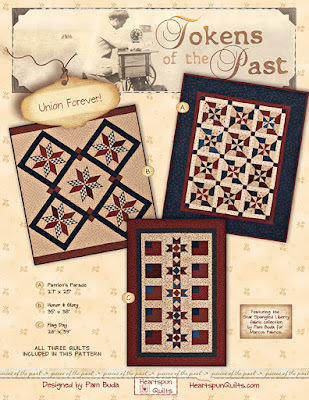 As you can imagine, after piecing both versions of the Block of the Month quilt, and the new Tokens of the Past: Union Forever trio quilts, I have fabric scraps with pieces big a small.....red, lights and blues, and I have enough for several winners! Can you make use of some of my Star Spangled Liberty fabric scraps? I'm curious about your fabric tastes....what fabrics never, ever make it into one of your quilts? I work with and create fabrics that are Civil War reproductions, or choose to use fabrics that play very well with them. The fabrics I love would not be considered bright by any means, even if they are true to CW reproductions. I can't add some of your favorites like cheddar....I just can't! I don't work in chrome yellow or poison green, and even my very favorite red won't be added if it's too bright. I'm not a lover of polka dots either. Don't own one printed dot, and I'm very picky about stripes, too. We all have our likes and dislikes, and I'd like to know what colors and prints never make it into your quilt! 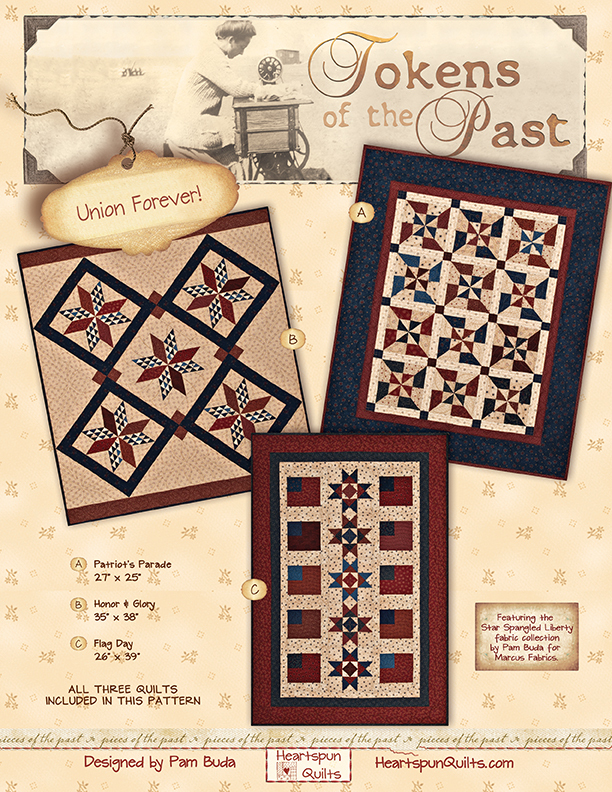 Leave me a comment about your fabric dislikes for a chance to win some Star Spangled Liberty scraps. For fairness to everyone, only comments to this blog post are eligible. If you comment anonymously, please consider leaving your email address in your comment. I have had more than a few anonymous winners never collect their prizes because they don't check my blog post to see if they won, and their prizes went to someone else. I regret that I can only ship to addresses within the U.S. I'll announce the winners on Monday, along with an introduction of my next fabric line for Marcus Fabrics, coming very soon! While visiting Maine and Vermont a few weeks ago, my hubby and I wanted to visit The Shelburne Museum and boy were we glad we did! We had no idea what to expect, but had heard many wonderful things about it. Both early American history lovers, we were sorry we didn't allow more time there. The museum has many historic buildings (most were moved there from another location) situated on 40+ acres of land. A shuttle bus allows on/off access as you move around the property, and the shuttle drivers fill you in on a lot of the history, and the exhibits housed in each building. Not knowing how long we would have and what was in store, I headed for the antique quilt exhibit first. This is the only photo I was allowed to take of the quilts. Of the more than 600 vintage quilts the museum owns, you can see about 60 antique quilts at on display any given time with half of the exhibit rotating every two years. There were remarkable pieces on display. I really enjoyed being able to "flip" through the quilts on those moving display boards. They were under glass, and you could really get up close to see the stitches and fabrics. Coverlets were housed in the same building Isn't this display of indigo and white stunning? Signage told the story of how the coverlets were made way back when, and any history of the weaver. These two beauties really caught my eye. The details is extraordinary. My heart just swelled taking it all in, and I thought how fortunate that it has survived all these years in perfect condition for us to enjoy now. As fibre artist, wouldn't it be something if our work survived this long and ended up in a museum? Don't think your work would make the cut? In the room next to the Coverlets was a collection of samplers....be still my heart! I'm betting that Miss Fanny Clark, 9 years old, never expected her sweet schoolgirl sampler to be in a museum either, so there's hope for us all! While I took my time staring, studying and appreciating all of the samplers in the room, it was this needle work that stopped me in my tracks. Only once before have I been in the same room with a piece like this (in the home of an antique sampler appraiser friend.) So very rare, they are seen mostly in books, this pole screen dating to c1810-1830 was the gem of the collection, in my humble opinion. The display card read as follows...."The pole screen was a practical object on which young ladies exercised their needlework skill. The purpose of the screen was to protect one's face from the heat of the open fire, and for this reason the height was adjustable." Love, love, love! For this Prairie Woman whom loves life in early America, this building was so fun for me!!! I could have pulled up a chair and stayed the day. The building was relocated from "downtown" Shelburne to the museum property decades ago. In its day, it was a bustling Dry Goods store that served the community, but had been boarded up, and sealed shut along with the contents of the shop displays, etc. Rescued from destruction, the museum took it and restored it to it's days of glory....just as it was when it closed its door. To walk through those doors is to walk back in time. The General Store volunteers are very enthusiastic to share their knowledge of the thousands of items in the shop. Just as you might expect, people would come to the store for everything they needed. Just look at all the yummy 'goods' you can shop for! Like this little sewing section with all those wonderful spool cabinets? Need a few storage containers? Band box? Firkin? Yes!!! The store also served as the post office. Did you notice this sign in the photo above. I had to inquire. A lot of General Store's bartered with the community, and offered credit. This sign means no credit and no bartering. Interesting.....another term of a bygone era. As with every generation, we loose phrases of everyday life, and with today's technology, it seems so many are disappearing much too quickly. Well...I hope I've given you enough of a sneak peek of just a few of the many, many things to see at The Shelburne Museum. There are so many reasons to visit Maine and Vermont, and I hope someday I'll return. The countryside was lovely, food yummy, and some of the warmest, friendliest people I've ever met. Back to work in the present day.....but I always take a piece of the nineteenth century with my everywhere I go. 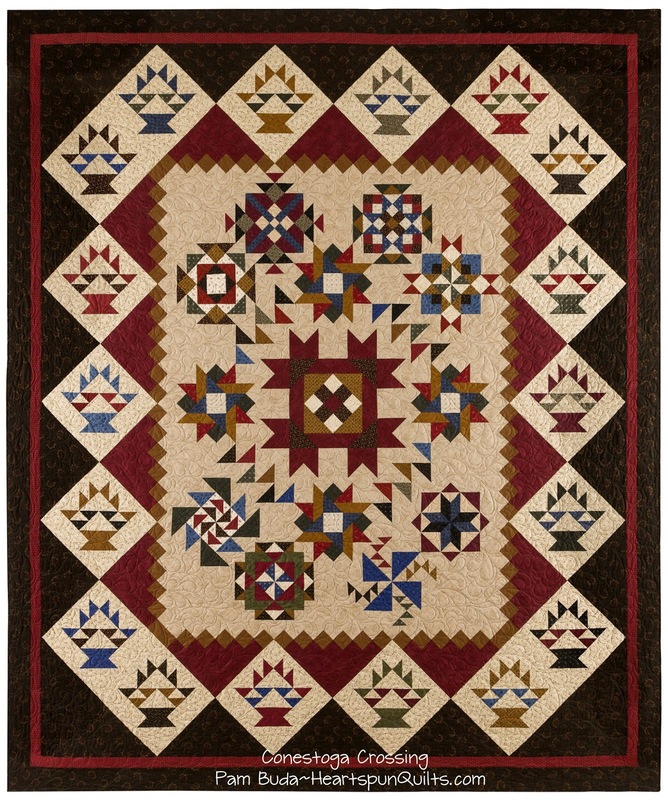 Conestoga Crossing by Pam Buda for Marcus Fabrics. Quilt size: 95" x 112"
You just have to take a look at the fabrics I designed for this quilt. Click here to see them on the Marcus Fabrics website. Very soon, I'll post more close up photos of the fabrics for you to enjoy. The colors are my favorites.... deep reds, greens, black, dusty golds, and a few yummy blues. All are reproduction prints created from my many antique quilts from that era. The black border fabric turned out better than I hoped, thanks in large part to Faye Burgos, my awesome Art Director at Marcus. We worked together to make it really special, and it has such a soft coloring about it, and looks very old, just as it should. Spectacular! You know how I love to include little historical stories about life in the 1800's, and I admit I am quite smitten with what it was like to walk The Oregon Trail. The stories are about preparing for the journey, what is was really like to walk the trail (yes, walk! ), some of the stops along the way, and arriving at the final destination....the Land Claims office. For the quilt design, I wanted to separate the center of the quilt and add a dramatic frame. Notice the medallion effect of the center "square" of Flying Geese which surround a large star....who doesn't love a star?! There are eight sampler blocks all framed by Chain Log Cabin blocks. I also just had to have basket blocks in this quilt, which are probably my second favorite block to make. I love all basket blocks, and this basket version seemed to really fit the quilt. Not to worry about difficult blocks...I promise!! All are rotary cut and use modern piecing skills you're very accustom to. The block size is 12" with the finished quilt measuring 95" x 112". I really hope you like Conestoga Crossing, and invite you to take the Journey with me on the Oregon Trail!! 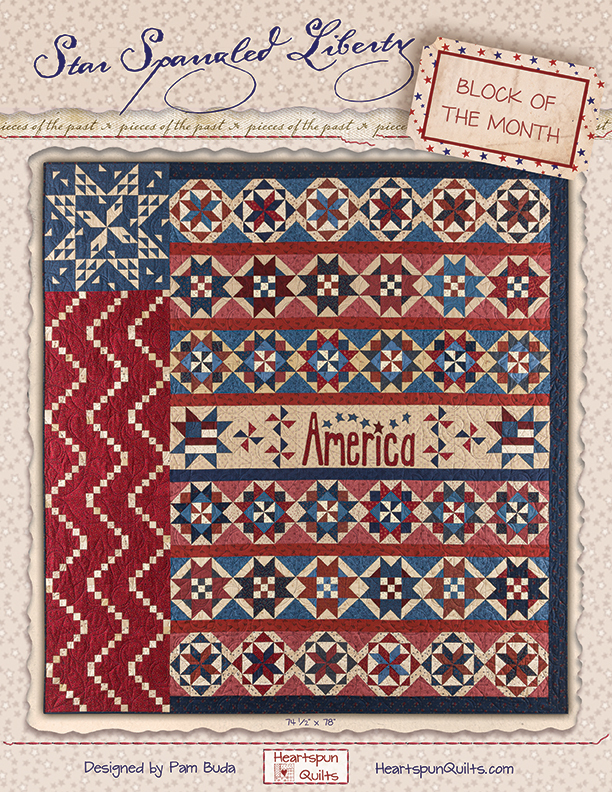 Conestoga Crossing is an exclusive Block of the Month program I designed for Marcus Fabrics and is only available through participating quilt shops. It will begin in January of 2017. Ask for it now at your favorite shop, and I look forward to seeing you on the Trail! After all the fun in Augusta, Maine, we were making our way toward Vermont but took a little time before we left Maine to visit a quilt shop that has long, long been on my wish list to visit. The Busy Thimble Quilt Shop in Litchfield, Maine. The shop is situated along a country road and down this sweet garden path. What's inside made this Civil War Repro lover's heart skip more than a few beats! You know that feeling when everything you see everywhere is what you love? Your eyes can't stop taking it all in. Yes, oh yes...that happened to me at Busy Thimble. I was talking with Cyndi and trying to take it all in all at once. I began my search. CW Reproduction fabrics.....glorious fabrics in every corner and sweet cranny!! This is the store where you want to move it. Put your purse down, find a chair and devour. I told Cyndi that her shop made me want to go home and start sewing. That means I was inspired....which doesn't happen at every shop I visit. Cyndi has many talents...obviously, but I've come to know her through her blog, and her true, uncanny talent to choose just the right fabrics that make a new quilt look 150 years old. You can see she has the inventory to do just that! I would go on record to say that if you love CW Repros like I do, visiting The Busy Thimble is reason enough to make a trip to Maine. Never mind you'll find lots and lots of wonderful things in Maine, but you need look no further for a reason to go. Treat yourself to Cyndi's blog....click here. An important note: I wanted to say that in my last post about the Small Quilts Inspired by Antique Quilts, I failed to credit Wendy Reed as the Co-Curator of the exhibit. It's important to me that creative credit gets its due....so please accept my apology, Wendy. The exhibit was stunning because of both of you! Coming next....a recap of my trip to the Shelburne Museum. Off to find a needle.....and where did I put my thimble? My husband and I arrived home late last night from eight wonderful days visiting New England. We began our trip in Augusta, Maine where I was a member of this year's faculty for the Maine Quilts Annual Quilt Show. And...what a show it is.!! Admittedly, I was so taken with and drawn into the entire show experience, I completely forgot to take pictures of the show!!! (Now..is this a bad thing to be "present" in what's happening in your life at the moment? I would say yes until the regret sets in when I wish I had photos to share and remember!) So, I'll have to paint a picture for you. They invited six national teachers and offered classes from each teacher everyday, as well as noon lectures while you enjoyed your lunch. Raffle baskets and a silent auction rounded out a bevy of activities. There was so much to enjoy over the weekend, and many, many quilters did just that! Off in a room all its own was a separate display of antique quilts curated by Cyndi Black of The Busy Thimble Quilt Shop. Cyndi and several of her extremely talented quilter friends showcased these antique quilts and made miniature versions of each!! Unbelieveable! The photos just don't do justice to the quilts....as always. The collection was called Small Inspirations from Antique Quilts. Cyndi and I are standing in front of a an antique potholder quilt on loan from a Maine museum. It was such a feast for the eyes in so many ways. Notice Cyndi's miniature version to the left behind me. Here is a full view of the original, antique quilt....velvet rope and all. This is Cyndi's miniature reproduction. If you'd like to see more about Cyndi's piecing adventures with this quilt, you can visit her blog, The Busy Thimble. I had the pure pleasure of visiting her shop, The Busy Thimble, and will post photos of that very soon. This quilt was one of my favorites because of the workmanship and challenge of the blocks in miniature. The Lone Star in the upper left corner for instance....so difficult...for me, at least! But what really blew me away was this Compass Rose!! How spectacular is that?!!! All hand pieced, too. I should hope I am ever this good! If you ever get the change to visit and take classes at this annual event, don't pass it up. It was one of the most memorable quilt shows I've ever attended. Click here for the Maine Quilts website and follow news of upcoming shows. My thanks to Callie and all the volunteers at the show, and to all of warm and wonderful quilters whom took my classes and lecture. You made me feel very welcome and I enjoyed every moment with all of you!! More about The Busy Thimble Quilt Shop and my travels to Burlington, VT, and the Shelburne Museum coming soon. Make your needle happy and go stitching!